The mummy, as a character, quickly became bland. In 1932, director Karl Freund, writer John L. Balderstein, and stars Boris Karloff and Zita Johnann made a poetic film for the Universal Horror cannon, re-working the story of Dracula in Egyptian guise. 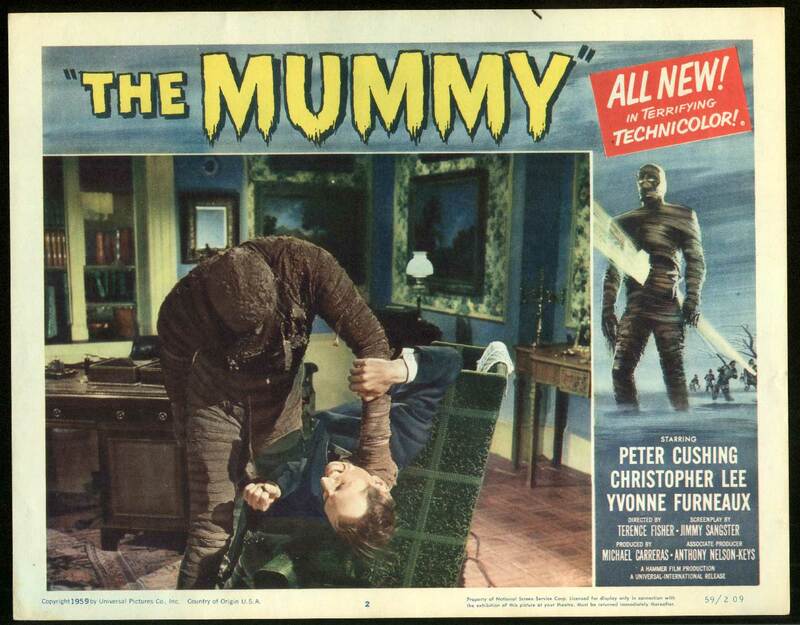 The Mummy’s Hand (1940) starring cowboy actor (and later Captain Marvel) Tom Tyron, was the first and only real decent of the Universal mummy sequels. 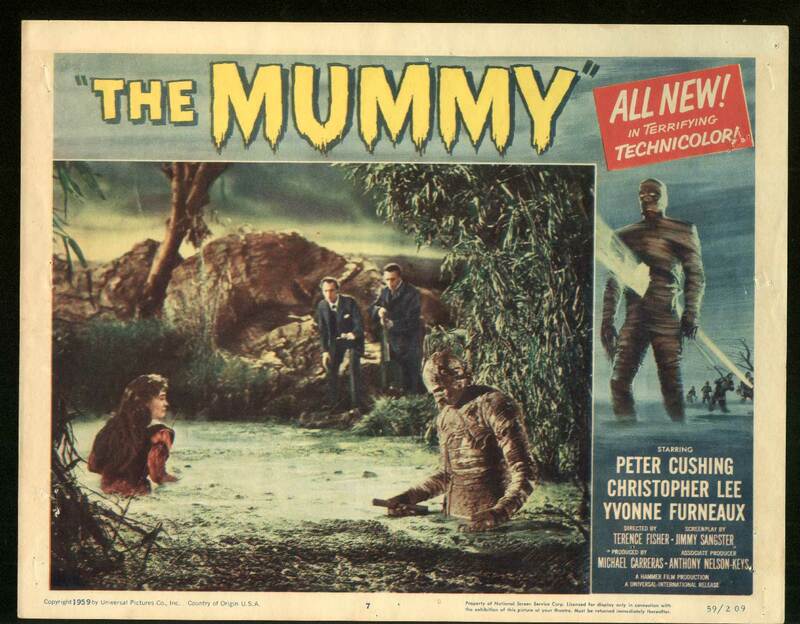 Increasingly feeble films followed Hand, all starring a rotund mummy in the form of a disinterested Lon Chaney, Jr. Dating back to the original, the plot rarely varied throughout the series. An Egyptian princess reincarnates in the form of a twentieth century woman, only to have her ancient lover come back, a tad lethargic, gauze and all, to reclaim her. Oddly, Francis Ford Coppola lazily utilized the mummy’s reincarnated dead lover plot for his version of Dracula (1992), which, otherwise, was a (mostly) well done, imaginative version of that story. In 1999 the mummy was revived again in a dumbed down, lame, testosterone-laden joke of a movie starring Brendan Frazier. That film also spawned numerous sequels. True to form,the succeeding mummy entries were even worse, which, in this case, isn’t saying anything. In between the 1932 and 1999 films, Hammer Studios predictably took a stab at the character. They spared no expense in soliciting the talents of Terence Fisher, along with top stars Peter Cushing and Christopher Lee. Where they did spare expense was in an original story. 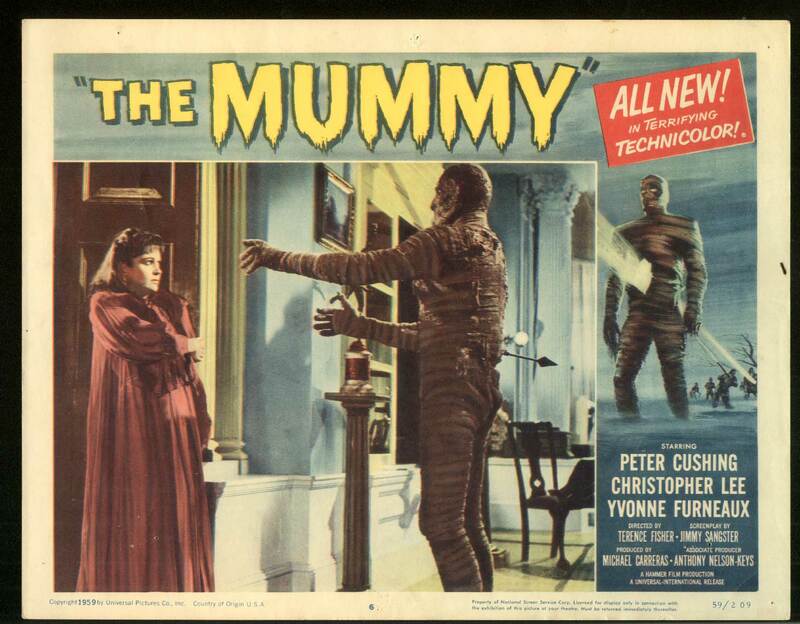 The Mummy(1959) liberally borrowed elements from the formulaic Universal series, and reincarnated the reincarnated princess plot. Briskly paced direction from Fisher, along with sumptuous color from Hammer cinematographer Jack Asher, almost overcomes the paint-by-number plot, which screenwriter Jimmy Sangster tried valiantly to inject with his own sensibilities. 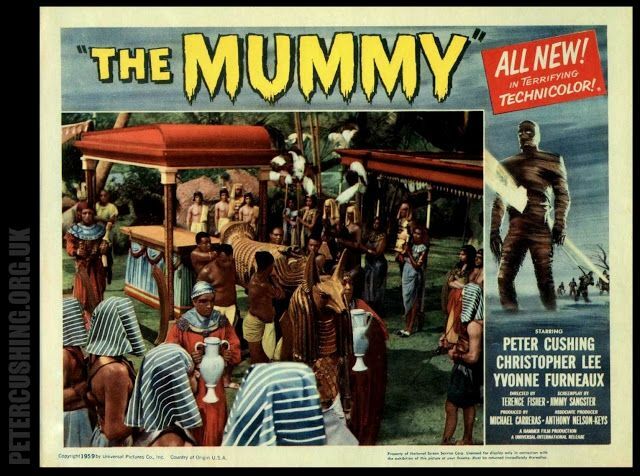 Of course, the medium of film is more than mere storytelling and The Mummy is a film that tries to go a long way to prove that; because, basic rehashed story aside, the film itself is no lumbering undead. It may be Fisher’s most energetic work. Kharis’ resurrection from the swamp is beautifully photographed and effectively conveys robust dread. 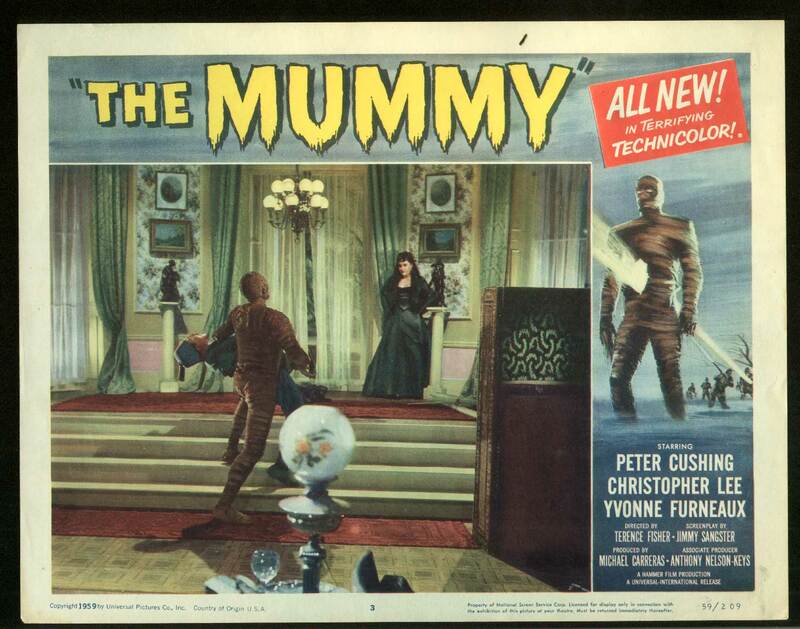 Another well-shot sequence is the mummy’s entrance into an asylum to exact revenge on Banning’s father. 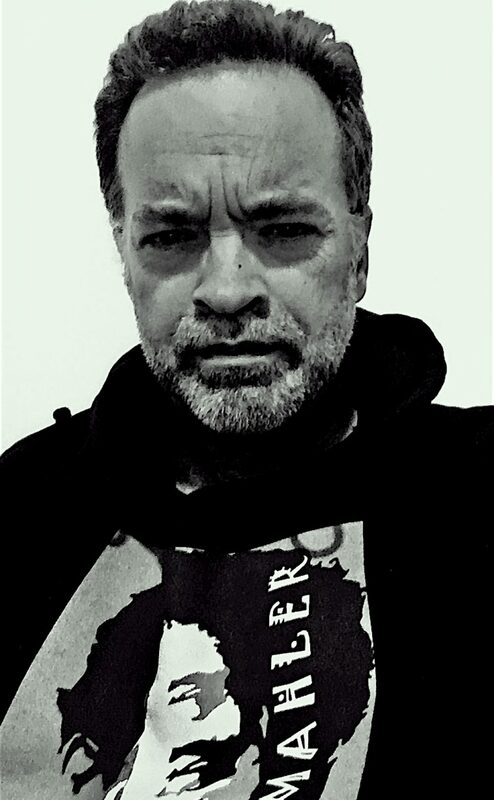 Franz Reizenstein’s score expertly accentuates the film, matching Fisher’s bloodied full moon milieu. 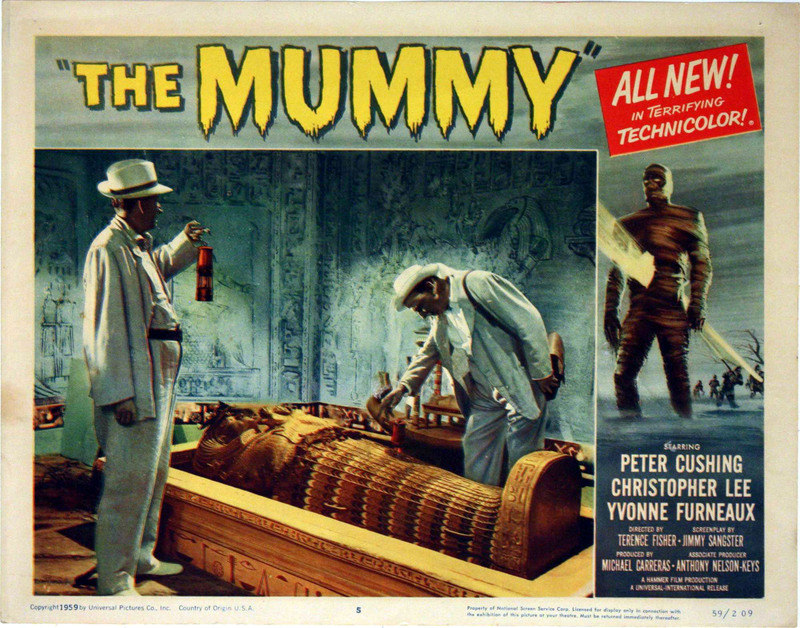 The Mummy reminds me a bit of The Guns of Navarone (1961). You know what’s around the corner, but that hardly stops the enjoyment of getting there. This entry was posted in Film Reviews and tagged 1959, Christopher Lee, HAMMER HORROR, PETER CUSHING, TERENCE FISHER by Alfred Eaker. Bookmark the permalink.